NOTE: This is a revised version of my original article. In that article, a central theme was that Fr. Joseph was half Greek and half Lebanese. I have since had the privilege of speaking with his granddaughter, who told me that he was actually 100% Greek, although he was fluent in Arabic (among many other languages) and had spent a lot of time among Arab Orthodox Christians. I’m happy to report that Fr. Joseph’s descendants have preserved his memory, and I hope to write more about him, based on their memories, in the near future. A hundred years ago, Orthodoxy in America was defined by ethnicity. Of course, this is still largely true today, but it was especially true in the Ellis Island era, when the vast majority of Orthodox people in America were immigrants from Eastern Europe and the Mediterranean. There was some overlap, sure, but as a general rule, parishes were divided along ethnic lines, and even within a multi-ethnic parish, the Greeks hung out with the Greeks, the Serbs with the Serbs, and so forth. Which makes sense, even if it’s not the model for the future. Given that state of affairs, it’s always a little bit of a jolt to find individuals who transcended those ethnic boundaries. People like Fr. Michael Andreades, a Greek priest who served in the Russian Mission before joining the Greek Archdiocese in the ’20s. Or Fr. Theoclitos Triantafilides, a Greek archimandrite from Mount Athos who tutored the Russian Tsar before establishing a Texas parish that’s now part of the Serbian Church. And now, an equally remarkable priest who crosses ethnic lines: Fr. 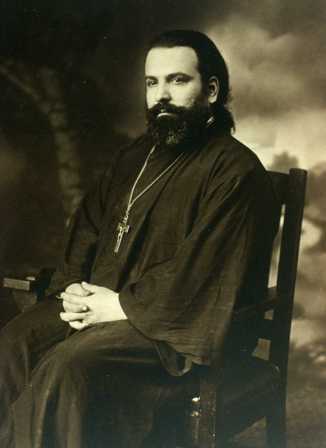 Joseph Elia Xanthopoulos, Greek priest who served under both St. Raphael’s Syro-Arab Mission and, later, under the Greek Archdiocese. When I first published this article, I said that Fr. Joseph was half Greek and half Lebanese. Since then, I spoke with his granddaughter, who told me that this isn’t accurate — Fr. Joseph was actually 100% Greek, although apparently he was so comfortable with other ethnic groups that the Lebanese thought he was one of theirs, too. Fr. Joseph’s own father was an import-export trader whose job took him all over the Mediterranean. So Fr. Joseph was born in Alexandria, Egypt, even though his family was from Greece. His birthdate was most likely September 14, 1886, although I’ve seen other dates as well, some as early as 1882. Fr. Joseph reportedly spent time at Balamand Monastery in Lebanon and went to seminary in Jerusalem. While at seminary, he met his wife Helen, who was Greek herself but was living in Palestine. They married, but before Fr. Joseph could be ordained, they had to leave for America — as best I understand it, they were basically on the run from the Ottoman government, but I’m still waiting for more details on that story. The Xanthopoulos family arrived in America in 1912. They already had two children, and they would add two more in America. According to Fr. Joseph’s granddaughter, word got around that a seminary-educated layman who could speak eight languages had just arrived in America, and someone — my best guess is St. Raphael Hawaweeny, bishop for the Syro-Arabs — approached Joseph Xanthopoulos about being ordained. After which, Fr. Joseph was assigned to St. Mary Syrian Orthodox Church in Wilkes-Barre, PA, a fledgling parish under St. Raphael’s jurisdiction. According to the history on the Wilkes-Barre parish website, Fr. Joseph’s “strong voice rang out in Byzantine chant. Many young people learned to chant with him, and he started a Syrian school for them.” This would be sort of a pattern for Fr. Joseph going forward — his focus on ministry to younger Orthodox Christians. In March of the same year, 1912, Fr. Joseph called a meeting of the Greeks in Wilkes-Barre “to establish a Greek Orthodox community.” Up to that point, the Greeks of Wilkes-Barre were renting space in a local Lutheran church, and a priest from Philadelphia — the great Fr. Demetrios Petrides, about whom I’ve written before — made occasional visits. But on Fr. Joseph’s initiative, the local Greeks organized themselves and established a proper parish community — and Fr. Joseph now had two parishes, one Greek and the other Antiochian. In 1915, the Greek parish purchased a house, and Fr. Joseph and his family moved in — the Xanthopoulos family lived on the first floor and services were held on the second. In February of the same year, St. Raphael died, and Fr. Joseph attended his funeral. 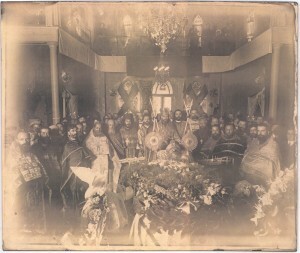 He’s included in the well-known photo of clergy surrounding St. Raphael’s casket at the memorial liturgy before the funeral. According to some sources, Fr. Joseph moved to the Greek parish in neighboring Scranton in 1917. He definitely had some sort of role with that parish, and later articles mention that he oversaw the construction of a new Greek church in Scrantion. In 1924, he’s listed as the pastor of St. George Syrian Orthodox Church in Scranton, under the jurisdiction of Archbishop Aftimios Ofiesh (leader of the “Russy” faction of Syro-Arabs). However, Fr. Joseph appears to have continued living in Wilkes-Barre: he’s listed as a Wilkes-Barre resident in the 1920 U.S. Census, and in 1922, he became a naturalized U.S. citizen at a Wilkes-Barre courthouse. Scranton and Wilkes-Barre are only 20 miles apart, so it’s entirely possible that Fr. Joseph was doing some sort of double-duty. I’m not exactly sure what his relationship was with the Greek Archdiocese, but it seems like he officially transitioned to that jurisdiction sometime in the mid-1920s. In 1927, Fr. Joseph was transferred to Holy Trinity Greek Church in Bridgeport, CT. As soon as he arrived, he established the “E Mirofori Society,” an organization for single girls who wanted to serve the church. (E Mirofori is a reference to the Myrrhbearing Women.) The girls formed the first parish choir, which is particularly notable because in this era, parish choirs with both male and female members were a pretty new phenomenon. Until this time, church music was provided mainly by male chanters. The society was still around 20 years later, when they had an anniversary celebration and invited Fr. Joseph back as a guest of honor. Eventually, the E Mirofori Society became the local branch of Greek Archdiocese’s Young Adult League (“YAL”), which still exists today. Also during his time in Bridgeport, Fr. Joseph oversaw the construction of a new parish building. This seems to have been his standard operating procedure: minister to the youth, build a church, promote wider involvement in church singing, etc. After a decade in Bridgeport, Fr. Joseph was transferred to Holy Transfiguration in Lowell, MA. Lowell had one of the largest concentrations of Greek people in America, and actually had three Greek parishes (one of which was under the schismatic hierarch Christopher Contogeorge, and the other two under the Greek Archdiocese). Fr. Joseph did his usual thing, working with the youth, running a parish school, establishing an Orthodox cemetery, etc. But, hey, what’s this? He also sponsored a youth football team? He did — a team called the Blackhawks. According to the Lowell Sun (Sept. 11, 1937), Fr. Joseph “will provide medical care for the players and will supply equipment.” I don’t know if that means that Fr. Joseph himself had medical training, or just that he was going to pay for medical care (probably the latter). The next year, he formed Boy Scout and Girl Scout troops for the parish children. Atypically, Fr. Joseph did not establish a young women’s organization in Lowell — but that was only because one already existed when he arrived. But he was enthusiastic about the group, the “Muses of Helicon,” and seems to have been generally a big supporter of organizations for Orthodox girls. While Fr. Joseph was now part of the Greek Archdiocese, he didn’t forget his Antiochian roots. In 1939, Antiochian Metropolitan Antony Bashir visited Lowell, and Fr. Joseph was on hand for the events. His time in Lowell was busy, but it was also brief — just 2 1/2 years. In September 1939, Fr. Joseph was transferred to St. George in Springfield, MA. It was his final parish assignment, although he had an extraordinarily long retirement. But let’s not get ahead of ourselves. Fr. X., as he was affectionately known, was half Greek and half Lebanese and spoke Greek, Arabic and English fluently. For close to twenty years, he held the community together and dramatically increased the participation of the laity in various programs and ministries. Again, the assertion that Fr. Joseph was half Lebanese — and this, coming from the website of a Greek parish, where he served for 20 years. In 1940, Fr. Joseph orchestrated the purchase of a beautiful old Congregationalist church building, designed by the famed architect Richard Upjohn and big enough to accommodate the growing Orthodox parish. The church was designed for Congregationalists, so the choir and organ were located where Fr. Joseph wanted to put the Orthodox sanctuary. The parish removed the choir section, moved the pipe organ, added iconography to the walls and ceiling. I’m not sure if Fr. Joseph used organ music in the church services, but it’s something I hope to find out. [T]he real model for his life is an elderly priest, now retired, who recognized and channeled his boyhood desire for the priesthood. That priest, Father Joseph Xanthopoulos, was the Springfield pastor, and from the age of 8 until entering seminary Father Andrew was with him at every opportunity, learning whatever he could. Fr. Andrew himself was apparently an outstanding pastor. A memorial article on the Greek Archdiocese website describes him thusly: “In the parishes he served, he is remembered for the inspiring sermons delivered and bulletins he published treaching the word of God. Fr. Andrew served his parishes as a humble servant of God. He tended to his flock defending Orthodoxy and preached the word of God with zeal and enthusiasm.” He sounds like a worthy protégé. Fr. Joseph retired in about 1960, or perhaps a year or two earlier. One of his daughters moved to Chicago after getting married, and Fr. Joseph moved along with her. His final years were spent in Chicago, first at Assumption Greek Orthodox Church in Chicago proper, and later at St. John the Baptist in Des Plaines, IL. Fr. Joseph died on July 22, 1981, in a nursing home in Des Plaines, a suburb of Chicago. He was either 94 or 98 years old, depending on which source you prefer. According to his obituary, his wife Helen and two of his four children preceded him in death. So, how to close this little biography? I was first attracted to Fr. 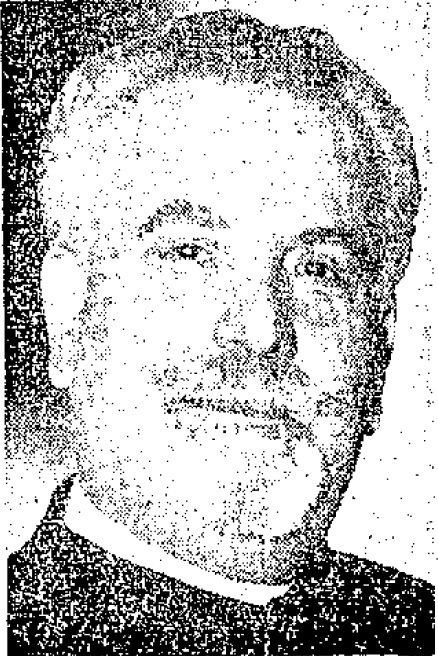 Joseph Xanthopoulos because of his last name — a Greek name sticks out in a list of Arab clergy. But in the end, the remarkable thing about Fr. Joseph isn’t his ethnic background at all, but rather his pastoral ministry. Based on all the evidence I’ve seen so far, he strikes me as a sincere, genuine, hardworking priest who was well-loved and fondly remembered by the people he served. He built churches everywhere he went, and started youth organizations, and particularly encouraged young women to be involved in the church. He was an exceptional parish priest. But… no, that won’t do, because this isn’t really a conclusion at all. This is actually a heavily revised version of my original article, and it’s heavily revised because I had the privilege of speaking with Fr. Joseph’s granddaughter, who corrected some of my facts and told me that Fr. Joseph’s descendants had preserved his memory, so there are a lot more stories to tell. 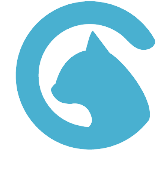 Soon, I hope to publish much more on Fr. Joseph, based on the information so carefully preserved by his family. His World War I draft registration card, dated Sept. 19, 1918, puts his birth date as August 28, 1882. The 1920 U.S. Census says he’s 39, which implies a birth year of either 1880 or 1881. A passenger manifest from June 1927 says he’s 41, suggesting either 1885 or 1886. The 1930 U.S. Census says he’s 47, which implies either 1882 or 1883. His World War II draft registration card, dated April 27, 1942, has it as September 14, 1886. His Social Security death record also says September 14, 1886. And finally, his Chicago Tribune obituary goes with 1886. So, yeah: I don’t know when he was born. “Circa 1882-1886” seems like the best we can do, for now. Oh, and another ambiguity about his birth — his World War II draft registration card says that he was born in Tripoli, Greece, but his Chicago Tribune obituary (and, now, his granddaughter) says he was born in Alexandria, Egypt. The 1920 Census says Greece, the 1930 Census Syria. Philip K. Hitti, The Syrians in America, 1924. Globe-Gazette, Mason City, IA, Dec. 3, 1960. Obituary for Rev. Joseph Elias Xanthopoulos, Chicago Tribune, July 23, 1981, page B16.